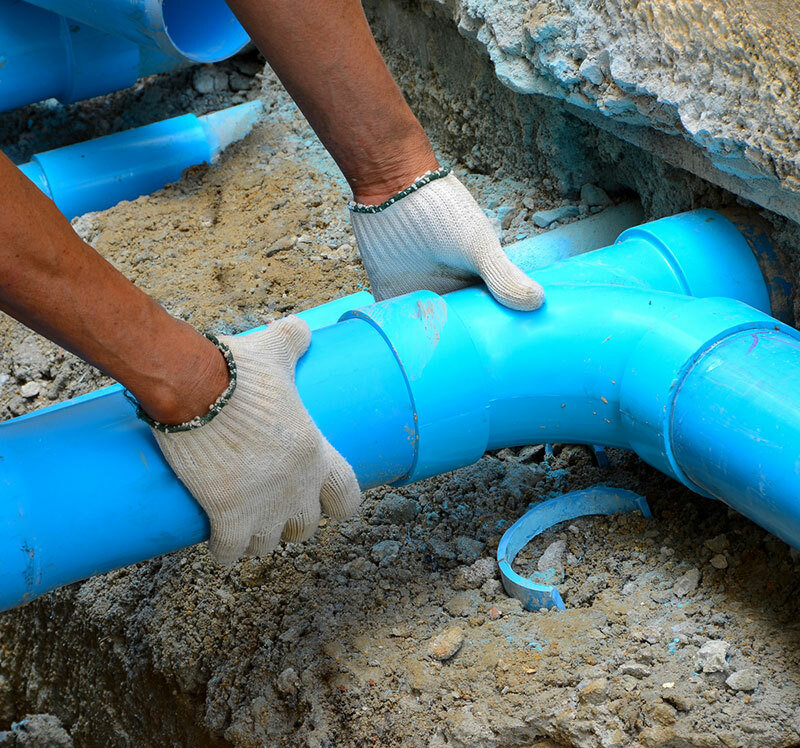 Municipal water providers can vary how much they charge to new hookups to cover both the direct cost of connecting to a utility’s water system and the capital costs (infrastructure and supply acquisition), based on how much water the new development is expected to use. These one-time fees provide water providers with revenue and can be designed to influence water demand in new development. These fees are common in the West, but are rarely used to influence the water footprint of new development, despite the fact that encouraging water efficiency at the time of development is more cost-effective than implementing water conservation after construction. There is a direct relationship between the cost of water and wastewater infrastructure for future development, and the need to acquire new water supplies. Therefore, basing water connection charges on the amount of water a development will use is more equitable and should be considered by municipal planners as they consider future development patterns and cost management. Factors that may be considered in designing water-conservation connection charges are lot size, irrigation area, house size, numbers of bathrooms, type of landscaping, and predicted use based on the water system’s database of past use by various types of users. In Arizona, water connection charges have generally not been used to influence development. The median single-family residential connection fee in Arizona is $4,800. In the Verde River Watershed the connection fee in Prescott was $5,561 in 2015, while the City of Cottonwood does not charge a connection fee except for the cost associated with physically connecting to the City water system. Photo Credit: Western Resource Advocates. The growing city of Aurora is faced with increasingly difficult to acquire and expensive new water supplies while only being about 2/3 built out. The City’s previous connection charges were not covering their water acquisition and infrastructure costs, and a shift in water demand and development patterns resulted in residential customers subsidizing larger commercial water users. To pay for supply acquisition, reduce the amount of new supply needed, and better balance costs among customers, the City adopted a connection charge schedule to correlate water fees with expected indoor and outdoor water demand for each customer class. They analyzed their costs per gallon of water delivered to their different customers and adjusted their fee schedule. 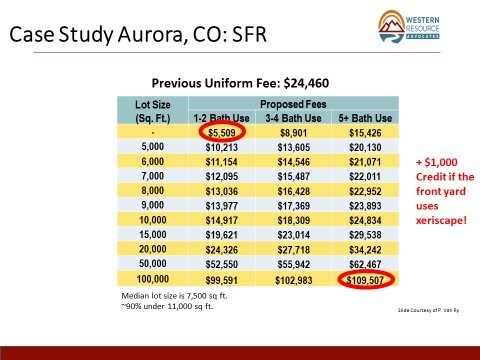 For new single family residences, connection fees were based on lot size and the number of bathrooms, reflecting both expected outdoor and indoor water use. In addition, an outdoor incentive is offered via a $1,000 credit for front yard Xeriscape. An important incentive is the “z-zone” for commercial and residential common area landscape customers with a separate water meter. These customers are reimbursed for the cost of the meter, which is substantial, if the landscape requires no water after plant establishment. As shown in the following table, the magnitude of difference in fees is a powerful incentive for developers to build smaller homes on smaller lots and to install water efficient landscapes. The Home Builders Association, developers, and others were involved in development of the new fee schedule, and the water utility is now more involved in the development approval process. The z-zone voluntary option has been very successful with 5 of 6 plans using the option within the first few months of adoption, saving 21 acre-feet of water a year.